If the ground sank equally, there would be no effect on the structures and functions of the airport facilities. However, because the depths of the settlement vary by location, significant problems, such as warping in building structures, occur. Buildings, especially, are very sensitive to this process. 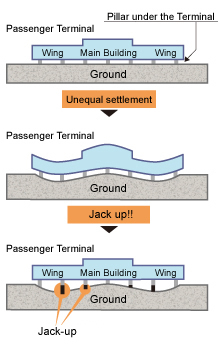 Kansai Airports takes the following steps against unequal settlement underneath buildings. The concrete foundation is directly constructed on the seabed so the entire construction settles equally regardless of an unequal settlement. We have compacted the 30m deep reclaimed layer in order for the sand not to contract due to unpredicted events (earthquakes, etc). The system lifts each of the buildings. It includes installing iron plates to adjust and even up the sloping surfaces because of unequal settlements. Fortunately, ongoing settlement of the first island can be attributed to the settlement of the Pleistocene layer, which is hard and is of almost the same thickness. If the weight of the KIX islands on the Pleistocene layer were the same all over the KIX islands, settlement above sea level would be almost uniform. In fact, unequal settlement that could cause functional problems with the main facilities such as runways and taxiways has almost not occurred at all. The huge passenger terminal is KIX's signature building, and one if its unique features is its big basement in the terminal’s main building. Consequently, the main building is lighter than the adjacent structures. Iron ores have been installed all over the bottom of the main building as weights to even out the weight distribution. However, the main building remains lighter than its neighbors. The depth of settlement under the main building is relatively shallow when compared with those of the nearby buildings. The difference in depth generates slight tilts between the main building and the wings of both ends, seldom visible to the naked eye. 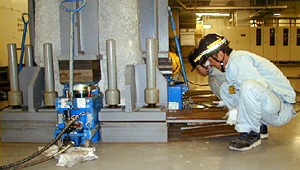 Therefore, the pillars under the passenger terminal have been lifted in order to level the floor of the terminal. Terminal 1 building has 900 pillars installed at the bottom. The settlement at each pillar is automatically measured so that we easily know which pillars need to be raised. Lifting up the pillars under the passenger terminal is done once every few years.